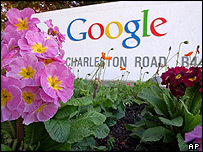 After its shares hit an all-time high on the New York markets on Tuesday, Google is now worth $80bn (£44bn). This takes it ahead of media leviathan Time Warner, which is valued at $78bn. The valuation comes in spite of the fact that Google's annual sales total just $3.2bn, a fraction of Time Warner's $42bn. Others maintain that Google's high stock value reflects its future earning potential and that its shares could go as high as $325-350. Google has become the world's most highly-valued media company after only 10 months of trading as a public company. It now dwarfs more traditional media companies such as Viacom and Walt Disney, which have stock market capitalisations of between $54bn and $55bn. When it first floated in August last year, its shares debuted at $85. Google makes most of its money from the sale of advertising that sits alongside its search results. Google was founded in September 1998 by former Stanford University computer science students Larry Page and Sergey Brin. They initially launched the business from a friend's garage after pulling together $1m from family, friends and other investors. Now still in their early 30s and both multi-millionaires, Mr Page and Mr Brin are said to continue to live modest lifestyles.